As snow begins to cover the leaves that many of us have not yet found the time to rake, fall is quickly slipping away and a cold Northern Michigan winter is not far off. Some members of our “snowbird” community will be leaving the Great White North soon, if they haven’t already, in search of a more temperate climate. Then there are those who stay and revel in the recreational opportunities that winter brings. Meanwhile the rest of us hunker down in our dens and pseudo-hibernate, only coming out for special occasions. 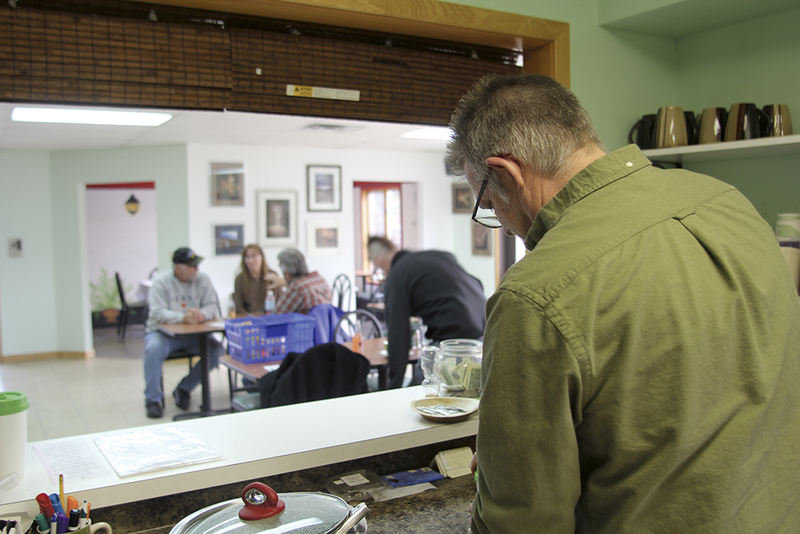 If a big, fancy, tropical vacation is not in your budget this winter, maybe you can be contented by lunch at Charlie’s Natural Food Market, located next to the Betsie Hosick Health & Fitness Center at the top of the hill just outside of Frankfort. Started by Charlie McDaniel and his wife, Wendy, back in August 2011, the 3,200-square-foot grocery store features fresh, local produce and good-for-you, organic groceries. About one-third of the space is dedicated to a café that serves breakfast and lunch, along with fresh-pressed juices and specialty coffee drinks. Last November, the café started running a lunch special called World Tour Wednesdays. All winter long, until just after the snow finally broke in May, Charlie’s kitchen crew would scour cookbooks, the web, and even their own secret family recipes to find new and interesting dishes to serve each week. The list has included: a Mediterranean platter (Greece), a Middle Eastern platter, vegan lasagna (Italy), sushi and nori rolls (Japan), beet latkes (Poland), bobotie (South Africa), coconut curry (Thailand), and sudza ne nyama (Zimbabwe). Sometimes the staff went for the more traditional take on recipes, as was the case during the week of St. Patrick’s Day when they served up an Irish boiled dinner of meat and cabbage—instead of corned beef, they served the more traditional ham. Other times, the team felt compelled to give a spin on traditional recipes, such as sweet potato burrito. Many dishes call back to places that the McDaniel family has lived, such as Cincinnati spaghetti and the African dishes. 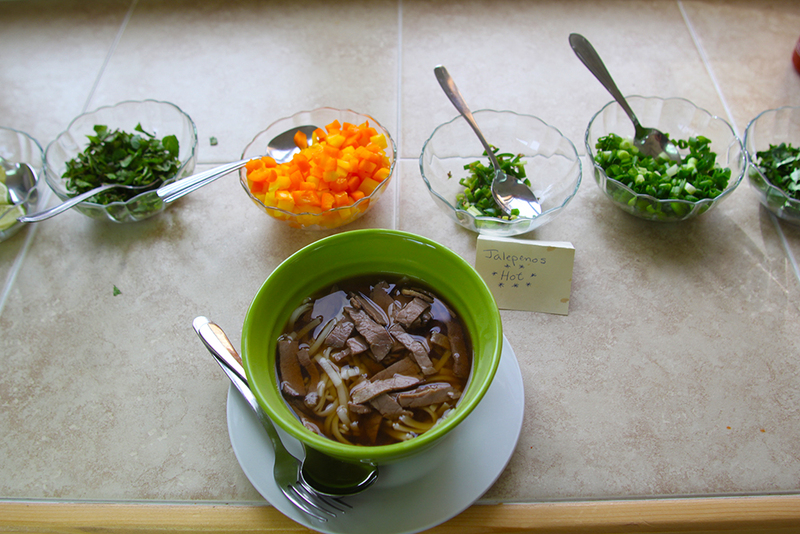 Charlie McDaniel prepares a bowl of pho, a vietnamese beef soup. Photo by Aubrey Ann Parker. Originally from Cincinnati, Charlie followed his missionary parents to Zimbabwe (called Rhodesia back then) in 1972 when he was 18 years old. He stayed in Africa for the next 13 years, enduring the before, during, and after stages of Rhodesia’s tumultuous civil war which started in 1974 and ended in 1980. Upon returning to the United States, Charlie stayed in the Lansing area just long enough to find a wife and start a family. When Charlie returned to Zimbabwe a few years later in 1988, he took his family with him. The McDaniels would run a 400-acre organic farm and raise cattle for the next decade. Little did any of them realize that this way of life was a foreshadowing of what was to come more than two decades later. The family moved back to the United States in 1988, and they settled in Frankfort. (Wendy is originally from Kalkaska, so she had family in the area.) Charlie dabbled in a little of this and that for employment. 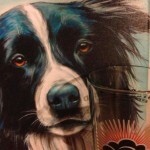 By 2010, he had already begun thinking about what was next. But it wasn’t until Charlie began having health problems that the idea of food became so important. After reading studies that linked health to diet, he became vegan and started eating better. But this often included long, expensive road trips from Frankfort to Oryana at a time when gas was more than $4 per gallon. “I figured, if I’m sick of driving to Traverse City, then other people are, too,” Charlie says now, looking back. 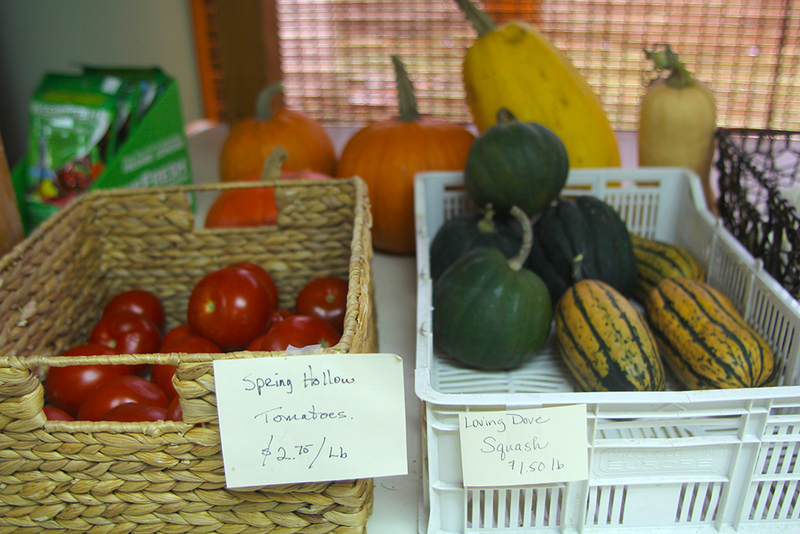 The idea of a natural food market in Benzie County seemed like a good one. So with the help of community investors, Charlie opened his grocery store three years ago. He now stocks fresh produce and meats from five local farms, in addition to vitamins, cereals, juices, snacks, and even organic pre-packaged meals for those who don’t want to cook. Moreover, he’s willing to stock any requests that he receives from patrons. “As long as I can physically get it here, I’ll order it,” Charlie says. Originally, the café was meant to be more of a side project, but it has really taken off. It accounts for most of the work that is split between Charlie and his 29-year-old daughter, Ashleigh (both full-time), as well as his wife Wendy (part-time). Speaking of “ask and you shall receive,” another of the café’s favorite items is Pho Friday, a suggestion from The Betsie Current’s own co-editor Jordan Bates. Having seen a television program on the Vietnamese beef noodle soup, he asked if Charlie’s could start making it on a regular basis. Customize your pho with the toppings of your choice, from mint to jalapenos. Photo by Aubrey Ann Parker. “If you help advertise it and get people through the door, we’ll make it a weekly thing,” Charlie told Jordan. True to his word, Pho has become a weekly staple to kick off the coming weekend. So stop in around noon and ask for a bowl on Fridays all winter long, and make sure to stop in for the ever-changing specials of World Tour Wednesdays also.